Marques de Murrieta Gran Reserva has a dark intense red brick colour with a mature aroma of mellow red and dark fruits with hint of spicy oak. Full bodied and generous fruit softening as it matures. Lovely finish full of spicy fruit as it starts to soften and mature. Grapes 91% Tempranillo, 4% Mazuelo, 3% Graciano, 2% Garnacha. Grape varieties: 91% Tempranillo, 4% Mazuelo, 3% Graciano, 2% Garnacha. Manual harvest: From 19th to 23th September 2011. Winemaking: Grapes are first de-stemmed and then fermented in temperature controlled stainless steel tanks for 9 days, with constant skin contact. During fermentation pumping over and punching down operations are regularly carried out. These processes ensure both effective and gentle color and aroma extraction. Afterwards the solid parts of the grapes are squashed in a vertical press. 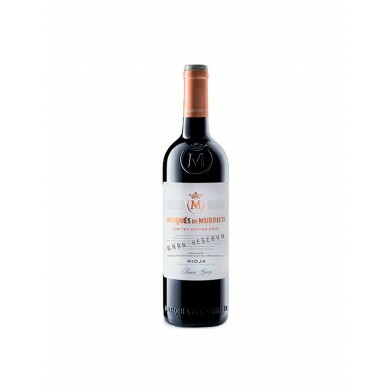 This is a gentle process that extracts color and ripe tannins from the grapes skin. Bottling date: 15 September 2014. NUMBER OF BOTTLES: 50,092 (75 cl).